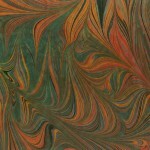 One of the things that I enjoy most about hand marbling fabric is creating the color combinations. Autumn or Wild Copper starts with the same hand dyed Copper that you will find on my web site. But rather than marbling on it in the muted colors that you will see in my hand marbled Copper, I have added contrast. Orange, Yellow, Red, Turquoise, Green and Black to make it pop. Why call it Autumn? When I look out my back door that is the color of allthe the ferns, foliage and leaves. This entry was posted in Featured Fabric by Suzi. Bookmark the permalink.